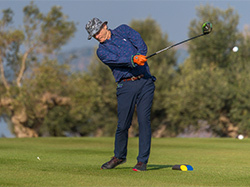 PGA of Italy's Alessandro Tadini retained his concentration amid the celebrity spotting to win the season-opening event, at the Mediterranean's leading destination, Costa Navarino, in Greece. Tadini's final tally of 197, 15-under par, was a hugely impressive 11 shots ahead of his nearest rival, Wentworth's Stuart Boyle, following two rounds of golf on the Dunes Course and one on the Bay Course. The 45-year-old Italian was full of praise for the destination, saying: "I would like to thank Costa Navarino for hosting this wonderful event. It is a fantastic place with two spectacular courses, and myself and my team have had the most amazing time in Messinia." More than 120 professionals, celebrities and amateur golfers - including Oscar-nominated and Golden Globe winner Murray and rugby legend Tindall - enjoyed three rounds of competition golf in a professionally organised event, and a series of thematic social events culminating in a memorable gala dinner and prizegiving hosted by pro golfer and TV presenter Iona Stephen and golf coach and YouTube star Peter Finch. Murray was as in awe of Costa Navarino as Tadini, and said: "This is the best place I've ever been. The golf courses are great; I've never been treated nicer anywhere. This is a different level; it is not like anything I've ever seen." And Tindall added: "I can see why Costa Navarino is called a gem. The views are stunning and everyone is so friendly." The event was attended by a substantial gathering of international media while accommodation was provided for all at the five-star The Westin Resort Costa Navarino. Event partners included AEGEAN Airlines, a member of Star Alliance, the official airline of the tournament, and Erasmus, the official travel partner. View the video of the 2019 Messinia Pro-Am at Costa Navarino, here, while a gallery of images from the event is available here.